Sale of the Hon. Mrs. M... by Christie (London, July 6, 1894, no. 147) to Quaritch; purchased by Richard Bennett Apr. 28, 1896; Catalogue of manuscripts and early printed books from the libraries of William Morris, Richard Bennett, Bertram, fourth Earl of Ashburnham, and other sources, no. 64; purchased by J. Pierpont Morgan (1837-1913) with the Bennett Collection in 1902; J.P. Morgan (1867-1943). 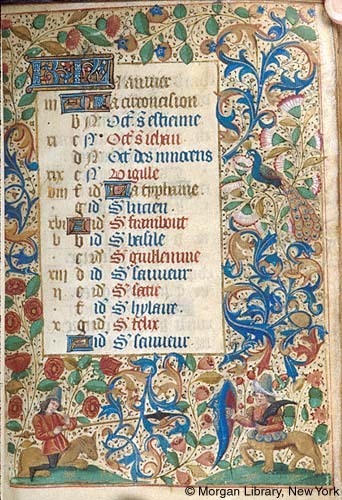 Ms. book of hours for the use of Rouen (Hours of the Virgin); written and illuminated in Rouen, France, ca. 1470. Decoration: 15 large miniatures; full inhabited borders.